My office building has a beautiful view of the Tennessee River. Often I get to watch the rowing team practicing while I should be working. It has always looked fun, so when a buddy suggested I add rowing to my 52 Things list I thought it was a brilliant idea. 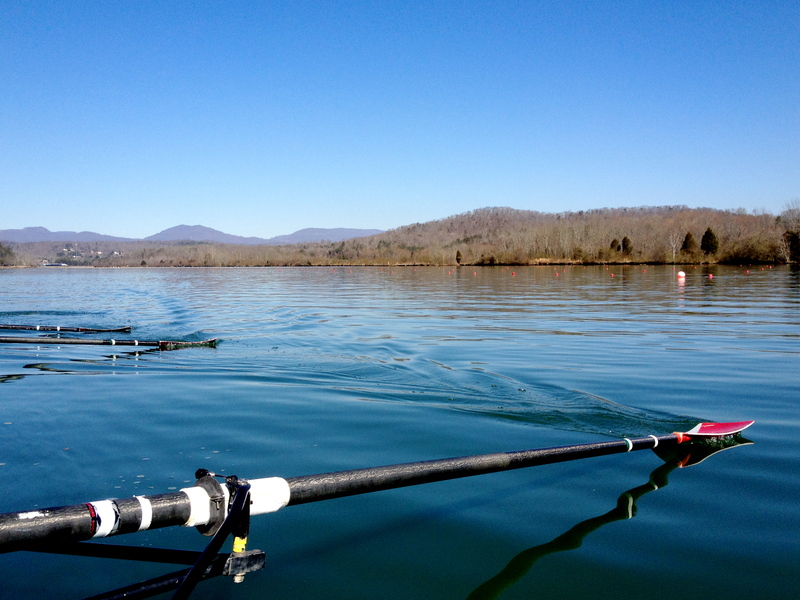 This week was The Oak Ridge Rowing Association’s annual Learn To Row free weekend, so it was the perfect time to test the waters and give boating a try. I convinced my friend Kristina to come along with me, promising her it would be a lovely 60-degree day. You see, she is from Jamaica, so anything below 70 might as well be subartic. While a beautiful sunny 60-degree day was in the forecast, when we started at 10AM it was still only 34 degrees. You know, because it is February. We started with a brief orientation and tour of the boathouse before being put to work on rowing machines to practice the proper stroke technique. We learned that rowing is 80% leg work and 20% arms and back. To me, it felt like 60% lower back, 30% arms, and 10% legs. I must have been doing it wrong. Once we finished practicing we carried our boat down to the water. This involved lifting it, carrying it on our shoulders (well, everyone else’s shoulders, it was a few inches above my head), and flipping it over to place it in the water. 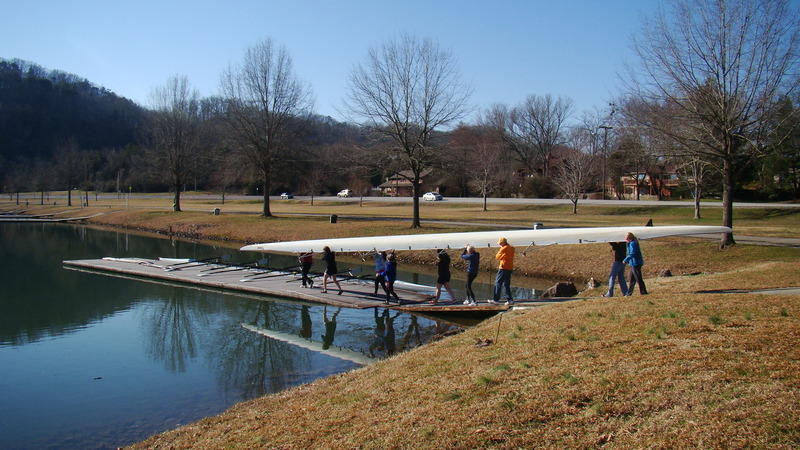 We used a sweep boat, which is one in which the rower has only one 12 foot long oar on one side of the boat. 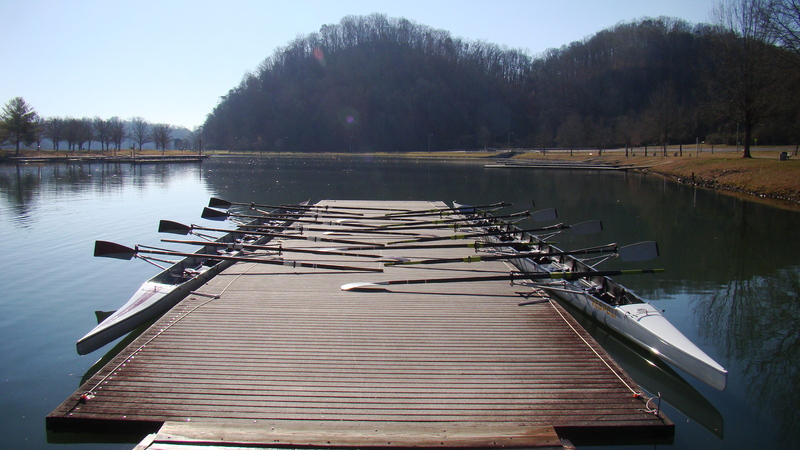 Our boat was an “eight,” meaning it sat 8 rowers plus the coxswain (the person steering and giving the directions). An “eight” boat is 60+ feet long, approximately 250 pounds, and can cost $35,000. I was in the bow seat (which meant I was in the last seat on the end of the boat closest to the direction of travel) and my oar was on the starboard side (it stuck out to my left). Our seats were on a track, allowing us to roll back and forth as we rowed. This is because you use your legs to begin the stroke, pushing back and then bringing the oar in close to your chest. I now understand why rowing machines are set up the way they are. Our feet were kept in place by shoes attached to the “foot stretcher” . . . these shoes were approximately 5 sizes too big for me. Once we were all situated it was time to row. The weather was quite lovely. It wasn’t too cold considering it was only 34 degrees; the rowing kept me warm and the sunshine on my face felt amazing. 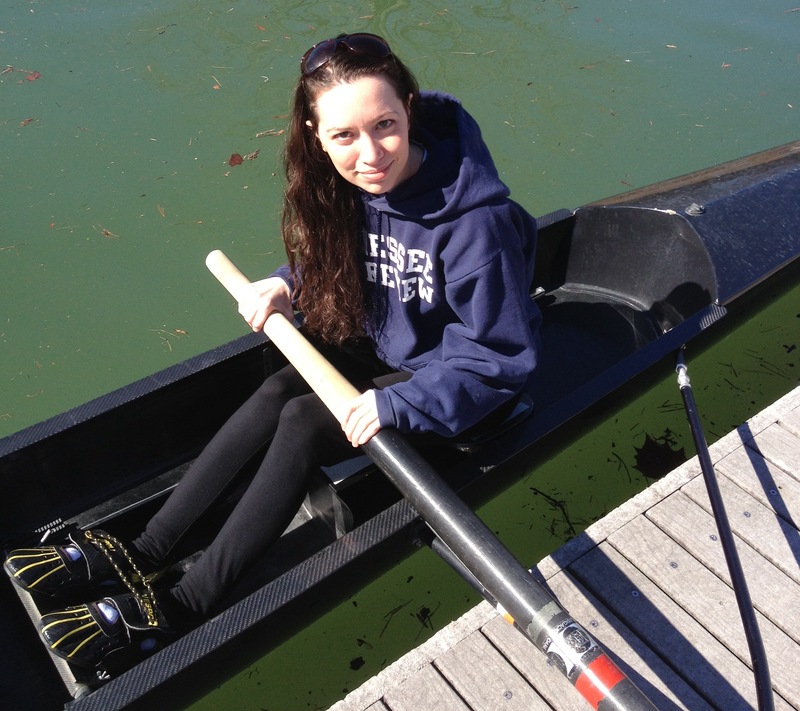 The actual rowing was a lot of fun and the time on the water was relaxing. We spent at least an hour practicing our strokes rowing in unison. It wasn’t as grueling as I expected it to be, but I was absolutely wiped out when we were done. At times, the oar was a little more difficult to control than I expected. Occasionally, the water and movement of the boat would catch it, making it difficult to get it out of the water smoothly. Twice the water caught the oar and threw me sliding back in my seat. For a moment I was worried that I was going to be sent flying out of the boat. But all was well. While I don’t think I will take up rowing this season (too many other New Things to do), it is something that I am considering doing in the future. When we were on our way out we noticed a father and son feeding ducks and a nearby food dispenser. The son was feeding the ducks directly out of his hand, something I’d never done before. I figured if he could do it, I could do it. I got a handful of food from the dispenser to feed the birds. As they got closer, I immediately got scared that one would bite me and spastically tossed the food at them instead. 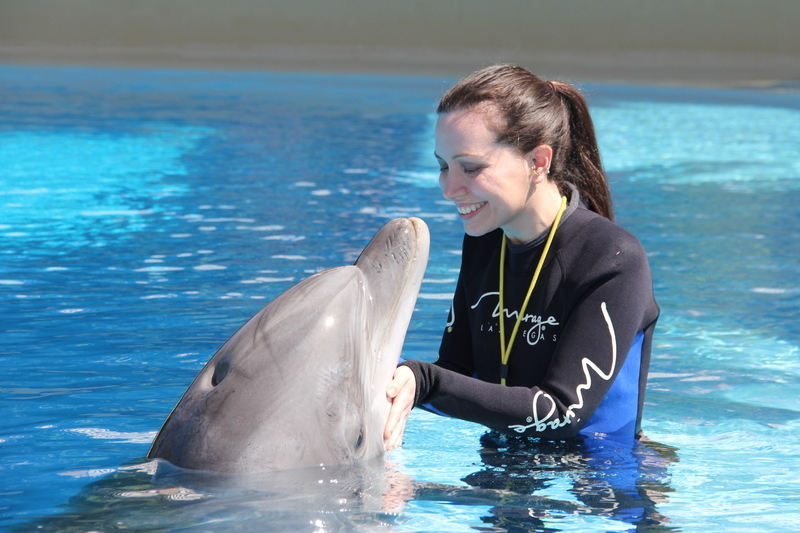 Then I realized that a 5-year-old was braver than I was and decided to give it another go. I again held out my hand and let the ducks approach. I can’t really explain what it felt like. There bills were hard but smooth and felt like little soft pinches on the palm of my hand. After feeding them, one of the ducks tried to sell me supplemental insurance, but that is a story for another day. 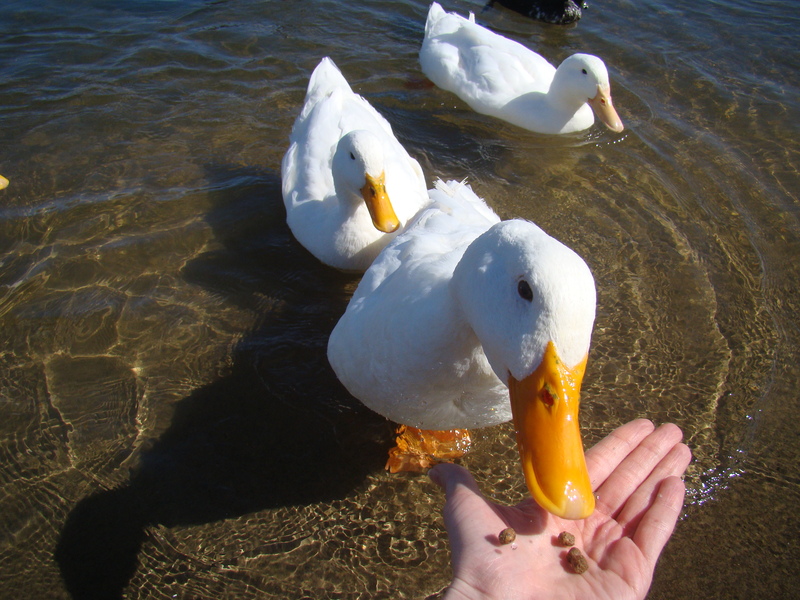 “After feeding them, one of the ducks tried to sell me supplemental insurance, but that is a story for another day.” —> LOL! Well played. Poor Kristina! Yall should go bob sledding next, ya mon! Funny, Gordon!! I’ll go if you’ll join us. Maybe I should try the Alpine Slide in Gatlinburg? Cool Runnings. Yes! Hike in the Great Smoky Mountains is definitely on the list. I was thinking maybe Mt LeConte? Someone else suggested Chimney Tops too. Which do you think I should try? Oh yeah now I see your first post/full list of things. Those are the two most popular trails from Gatlinburg. I think you should do Chimney Tops. I don’t know if you’ve hiked in the Smokies before. But Chimney would be great for just a day hike, takes maybe a couple hours. Mt LeConte I have done and it is amazing, but more of a full day thing. There’s a lodge at the top where you can spend the night or just hang out. I think it is pretty much impassible with ice at this time of year but later in the spring would be perfect. 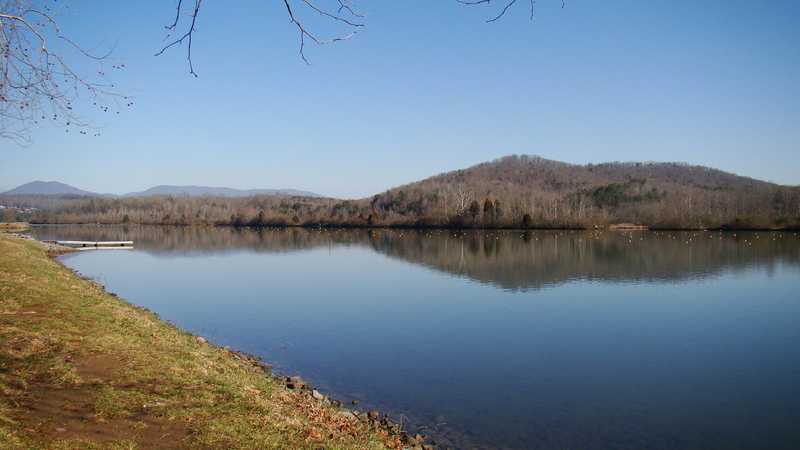 I look forward to seeing your report, I miss the Smokies since moving to Nash.